This entrepreneur combined her crafting skills with a bit of business savvy to put up a new venture. After some time with paper, scissors, and glue, most people leave their scrapbooking tendencies in the arts and crafts box. For Sunshine Asuncion, thoughnam, what started out as a hobby turned into an artistic business venture, Treasured Memories. Now she uses her crafting skills to make monogram cards—personalized cards bearing the stylized initials of the sender—she sells at bazaars. 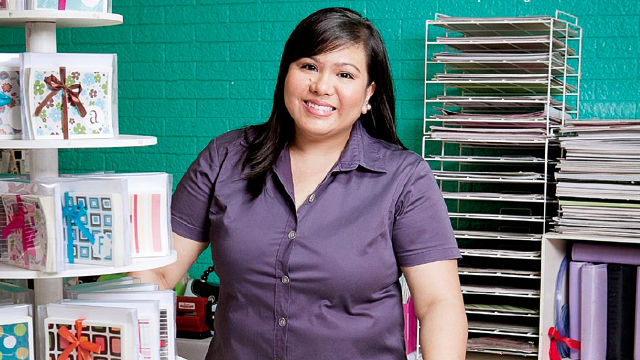 Before starting her business, Asuncion lived in the United States, where she had a scrapbooking group that initially consisted of seven women. They would decide on a date and place for their get-together and have a fun day of scrapbooking. But when Asuncion returned home, she found it harder to have the same kind of activity. “Women want to spend time with their kids during the weekends,” she says. So when her mother shipped 11 boxes of her scrapbooking materials, Asuncion needed to find a way to use them. “My friends suggested I think of something I can sell for the holidays, something cheap that people can give to their friends,” she adds. Asuncion thus began making monogram cards by the box. Every box she makes contains 12 cards, all pieced together by hand. Her first year in the business, Sunshine sold 200 boxes of her cards, and every year afterwards, she received more orders. Being a home-run business, Asuncion faces a slew of obstacles as well as opportunities. She occasionally has her sister assist her during bazaars to make up for the number of orders she receives. Although her business runs from 8 a.m. to 9 or 10 p.m. some days, Asuncion spends only two or three hours working. Asuncion also finds it difficult to source materials for her business. Whenever she travels abroad, she takes the chance to find unique materials for her cards. “Whenever I’m abroad, I hoard,” she shares. This also ensures that her cards are one-of-a-kind products. When it comes to expanding her business, Sunshine hopes to move her studio out of her home and into its own space. She does have some reservations about opening her own store. “Every business person dreams of expanding into a store,” she states, “but when you think of the overhead, rent, and other things, it becomes overwhelming.” For now, Asuncion is content with the business that allows her creativity to flow. This article was originally published in the January to February 2012 issue of Entrepreneur magazine. To subscribe, click here.